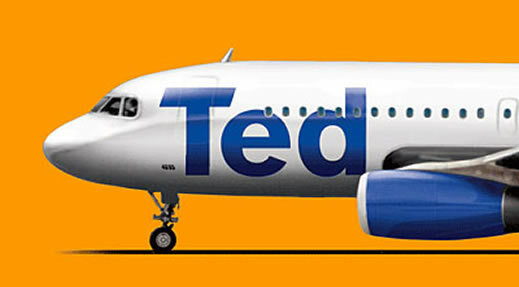 Ted is one of two airline divisional brands of United Airlines similar in concept to the Delta Shuttle or the US Airways Shuttle, however specifically targeted in the United case to compete effectively in the low cost airline market. In contrast to United's high end divisional "sub-fleeted" brand called United p.s., the rather uniquely named, "Ted," comes from the last three letters in the United brand name, thus giving rise to the quip "Ted is United without U 'n' I". Ted's creation was announced November 12, 2003, and service began on February 12, 2004. It began service in Denver, a United hub, to compete with Frontier Airlines. The airline is equipped with 57 Airbus A320 aircraft, in a 156-seat all-economy configuration. It was created to give United a way to compete with low-cost airlines, such as Frontier and Southwest. All Ted flights are operated by United Airlines crew flying under the United Airlines operating certificate, as Ted is not actually a certificated airline, but rather a brand name applied to differentiate the all-economy service from United's mainline flights. 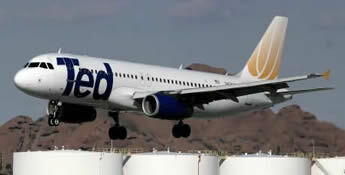 Sometimes, because of operational needs, Ted aircraft operate as mainline United flights. More often however, mainline United aircraft operate as Ted flights because of equipment substitutions. As of December 2007, Ted's average fleet age was 8.2 years old. Ted A320's are configured in 1 class that is split into 2 sub-classes. Economy Plus is the first sub-class which includes rows 1-11. Economy Plus provides an extra 4 inches to the existing 31 inches of legroom for economy. Ted planes are equipped with 20 overhead retractable LCD screens known as "Tedevision" which are used to play videos throughout the flight. First class seating is not available on Ted flights. On every Ted seat there is TedTunes which has 12 music stations including a station that plays live feed from Air Traffic Control, at the pilot's discretion.